Domaine de la Romanée-Conti is the most prestigious wine estate in Burgundy, based in Vosne-Romanée. DRC, as it is frequently called, is co-owned by the de Villaine and Leroy families and produces some of the rarest, most valuable and sought-after wines in the world. So, you can imagine my delight when a client asked me to quote for a tasting for one of her yacht charter clients of “DRC wines”. This could, of course, have gone two ways. It might have been that someone had simply heard the initials and decided to find out more, with their main motive being to have the best because, and perhaps only because, they were the most expensive. Obviously I still would have been overjoyed to stage a tasting for them! The chance to handle such wines does not come along very often, but there is always a risk of an unfavourable comparison to some ghastly sugary brand, a collection of ‘gulpers’ crying ‘next!’, or even - god forbid - amateur blenders and mixers (yes – it has happened – shudder). As it transpired, the Principal of the charter commissioned a tasting of these wines because he knew how good they were, and why, and was accordingly prepared to accommodate their cost. They were an utterly charming Swedish family whose English is, as seems common in Sweden, faultless and able to put many in England to shame. It was a fantastically fun evening, and I hope they enjoyed it even a fraction of how much I did. 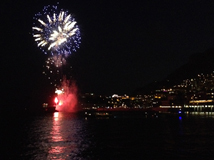 We were onboard a superyacht anchored off Monaco harbour, and the tasting (and their dinner) started after a terrific firework display, part of the annual Riviera ‘Feu d’Artifice’ competition, and on a near cloudless, supermoon-lit balmy August evening. Frankly, a tasting of much less than DRC might have risked seeming like an anticlimax. I was armed with sheaves of information about the Domaine, including a millennium of potted history, and stats about average yields, vineyard sizes, winemaker’s genealogy and all that. Important to do your research! Some (not much!) came in useful, as they were educated, knowledgeable and enthusiastic guests, but we touched upon the recent issues of weather, farming, fraud and market demands that have provided the most interesting backdrop to the story of Burgundy in recent years. In fact, the wines did the talking, and they sang. 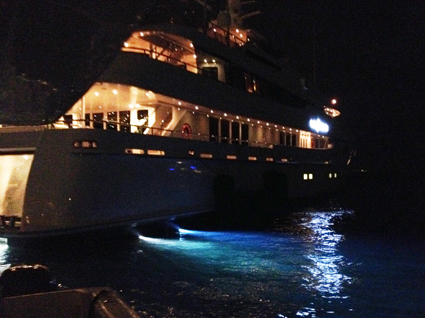 The yacht’s chef had prepared a wonderful meal, each stage of which accompanied the wines as they developed in flavour. 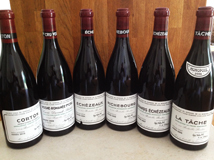 No mean feat when we were dealing with six Pinot Noirs! But the wines were oh so much more than this. And so was the food. I’ll never be rich enough to drink wines like these, and a small part of me actually almost wanted to be disappointed in them: to hope that wines I can afford might provide the pinnacle of quality, and everything further is just down to rarity, scarcity and Chinese demand. But as these six wines demonstrated, they have become valuable and rare for the logical and simple reason of their sheer brilliance. Even within the six, the build up in quality from beginning to end had me running out of superlatives very early on. I know the reasons – on paper – as to quite how these wines have achieved the level of grace, texture and style that they possess, but it does not make it any more believable when you have something in a glass that actually sends shivers down the spine like these did - in the way that listening to a wonderful piece of music can. These wines really do that. DRC acquired the lease of these tiny vineyards – from three parcels in Corton; ‘Clos du Roi’, ’Rennardes and ‘Bressandes’ in 2008. The wine is by reputation more ‘Corton’ than ‘DRC’ in style, and so it proved. This might change as the vineyards progress toward Biodynamic conversion. Even though it is very young, I wanted to show this wine because it is not very often that something new appears from a property like DRC. It does have the angularity of tannins and a slight sappy hint from oak (actually very limited new oak is employed currently), alongside bright, vibrant red fruit aromas and flavours. It is very good indeed, but does lack the texture and depth that characterises DRC, and I don’t think this is entirely down to the particular bottle’s youth. This superficially appears to be out of place, being ‘only’ a Premier Cru wine of Vosne-Romanée. In fact the cuvée exists largely as a home for some replanted and youthful vines across the Grand Cru vineyards and has been released occasionally since the 1934 vintage. In 2009, the fruit is largely from 12 – 15 year old vines in the La Tâche vineyard. These are not yet deemed mature enough to be a part of the La Tâche wine, despite being old enough to make superlative wine (as almost every other producer would with them). It is approachable in youth due to less use of oak, and the vibrancy of the fruit. But nevertheless it is in the classic DRC style. Rich, velvety and supple with the beginnings of the mouth coating milk-chocolate thing that seems to me to be a hallmark of the property. (Relatively speaking) a bargain. 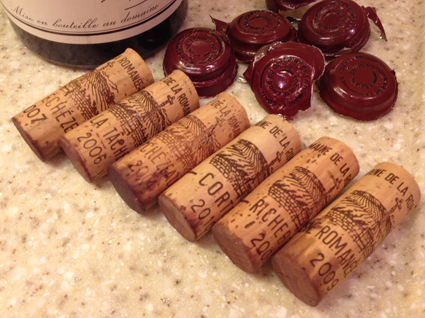 Six different vintages provided a talking point, and including the less vaunted 2007, also let me speak about the rigorous selection procedures employed at DRC as well as the ability of Biodynamically grown wine – seemingly – to avoid issues of vintage variations. More oak giving the wine the first example with lots of spice – sweet spices of cinnamon and vanilla backed up with powerful black fruit, verging on the tannic, and six years in bottle having started to allow the flavours of dried fruit and game to begin to develop. Despite its name, Grands Echezeaux is only one third the size of Echezeaux, but the latter arguably does not deserve entirely to have Grand Cru status (some producers’ wines certainly don’t). With just under 5ha of the vineyard, this is one of DRC’s largest productions, and often the most approachable and somehow straightforward of the wines. However with 10 years ageing, the nuances of mature wine have begun begin to develop with flavours of beeswax, forest floor and mushroom to complement the dried red fruit. There is the wonderful milk chocolate texture as well as the exotic spices, with some hazelnut and coffee on the finish. Truly superb wine and fabulously long. A tasting of six different DRC wines was never going to be anything other than expensive, and so the option of using old and mature examples was not really there (and more people prefer youthful Pinot Noir than mature wine in my experience. Unlike Bordeaux, these wines are delicious at all stages of their development). Neighbouring the Romanée-Conti vineyard, Richebourg has ten owners, and DRCs holding is 3.5ha of the 8 in total. It is always considered the greatest of the Grand Crus after Romanée-Conti and La Tâche, and one of the greatest wines of Burgundy of all. The name means ‘rich town’ but its origin is unknown. Some notes of youthful, sappy oak on the nose, but soon supplanted by masses of bright red fruit with cherry, plum and rosehip. In the mouth this coated every taste-bud with its silky, voluptuous texture and offered dried spices, coffee, chocolate and earth. A staggeringly delicious wine. Often considered the equal of, and occasionally the superior to, its more expensive neighbour, Romanée-Conti itself, La Tâche epitomises the DRC style. I had to show one of these wines, and I chose the 2006 vintage – a great one – which has shown itself to be one of the most rewarding in relative youth. Extravagant layers of plush red and black fruit along with sweet spices – an effortless collection of flavours: viscous texture and extract. Mouth-coating, with a silky chocolatey sensation, and the beginnings of waxy patina of maturity. A complete and super smooth finish that lasted for ages and – frankly – left me briefly speechless. If I were to win the lottery tomorrow, I would definitely spend some of it on these without hesitation. The feedback from the yacht is that the guests enjoyed themselves, and I know I did. A rare chance to try such beguiling wines, and in the perfect company and setting. The above notes are obviously posted with the permission of the client.